Summer is officially upon us, and that means one thing – beach season! But honestly, why limit it to beaches? Whether you plan on hanging out in a pool, a lake, a river, or the ocean – water sports and activities are most likely a part of your summer plans. When the temperature rises and school lets out, nothing is more freeing donning a bathing suit and heading outdoors. So as you grab a tote bag and toss in your waterside essentials. Remember to pack a towel, sunscreen, a change of clothes, and of course, your water shoes! Water shoes are great for protecting your feet from unpredictable depths. Slippery moss, sharp seashells, zebra mussels, and seaweed are all fantastic reasons to avoid plunging into the water barefoot. Plus, water shoes are great on land too! Water shoes are light and dry quickly. They make great walking-on-the-beach shoes and are perfect for when you get caught in a summer storm. Water shoes also come in a variety of styles. You can choose the ones that best fit your specific needs. Below is a list of our favorite water shoes, organized by style. Find a pair that works for you, and never again worry about cutting up your feet or ruining a pair of nice shoes as you stay cool this summer. 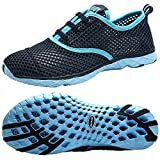 These water shoes look like a trendy pair of sneakers, with an airy mesh top and thick rubber sole. 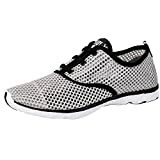 The mesh top helps water to drain quickly, and the rubber sole is strong and slip-resistant. This is a great shoe to take from land to water. It even comes in 14 fun colors so you can choose the pair that best suits your personal style. These are the exact same shoes listed above, but in women’s sizes rather than men’s. The important differentiator here is the color availability – where men have only 14 choices, women have an astounding 21. Everything from monochromatic neutrals to bright two-tone designs are available. Sandals are great in summer. They let our feet breathe and are generally more comfortable to wear once the temperature rises above 75 degrees. 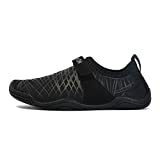 For those of us who want to enjoy that breezy feeling without sacrificing underwater protection, there are these sneaker/sandal hybrid shoes. They are vented in a few places, but also offer a lot of coverage. This pair, in particular, has holes along the sides that will help water to drain out, but also feature a strong rubber sole and top-of-foot coverage. They come in 10 different color combinations. Like the men’s version above, this sneaker/sandal hybrid features side vents with a strong, rubber sole. The drawstring along the top will keep the shoes tight and secure on your foot, even in moving water. With five color combinations, it will easy to make a pair of these shoes work with your summer wardrobe. For some, the breezy sensation of a completely open-toed sandal is worth the trade-off in underwater protection. It is important for the water sandal to stay securely on your foot. Teva is a tried and trusted brand when it comes to amphibious footwear. This particular line comes in 16 different colors. 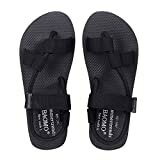 This sandal looks like a Teva with a bit more style. The toe loop and criss-crossing straps are stylish, yet functional, keeping your shoe firmly in place whether you are walking on land or through the water. It only comes in black but will work great as a neutral base for whatever you decide to wear on top. 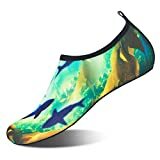 If you don’t care about a strong rubber sole and prefer a barefoot feel when it comes to your water shoes, then invest in these unisex water socks. They are made of polyester/spandex blend that is breathable and ultra light. These water shoes have an anti-slip rubber sole that makes them a great choice for in-water exercises like Zumba and Paddle Board yoga. They come in 32 bright colors and patterns. If you are a parent, your summer swim plans most likely include your children. So keep their feet safe and protected along with yours with one of the following pairs of water shoes. These shoes slip right on, which will save you from battling with laces or Velcro as your little one squirms in anticipation of splashing around in the water. They are made of a quick-drying spandex on top, and have a strong, yet flexible, slip-resistant sole. They come in a variety of sizes, including toddler, little kid, and big kid. These are available in five fun colors. If you are more of a fan of Velcro shoes, since they open up a bit more when you are trying to get your child’s foot in place, then these Carter’s (a trusted brand) shoes are a great choice for you. They come in toddler and little kid sizes, and in blue or pink. All of your kids can have matching footwear. So grab your swimsuit, your shoes, and your sense of adventure, and enjoy the warm weather this season!